Historically, institutionalized healthcare in Mexico began with Catholic hospitals dating back to the 16th Century. The Spanish Crown also built hospitals, that is prior to Mexican War of Independence in 1821. Almost a century later Mexico’s revised constitution of 1917 championed workers rights. And decades later, in 1943, President Camacho extended these rights to include access to healthcare, as part of the Instituto Mexicano del Seguro Social (IMSS). 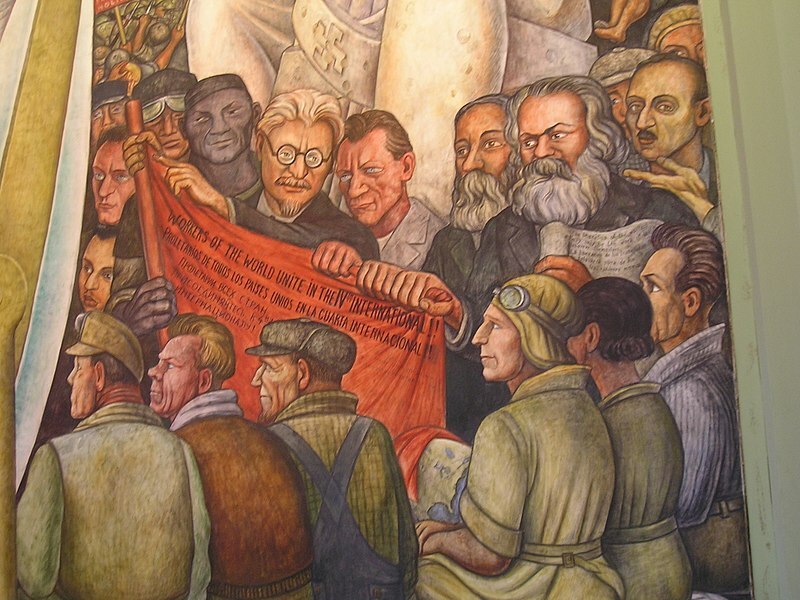 As governments are want to do, they set about promoting the new program—enter Diego Rivera. 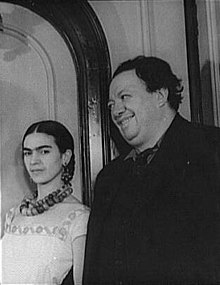 He and his famous artist-wife, Frida Kahlo, hosted Trotsky (the "good communist") when he was in exile in Mexico. Later, Rivera was invited to Russia to celebrate the tenth anniversary of the Communist Revolution. But his social ethics were more that of a humanist critic than dogmatic politician. Eventually, the Mexican Communist Party kicked him out, uncomfortable with his attachment to a Freemason–like occultist organization. 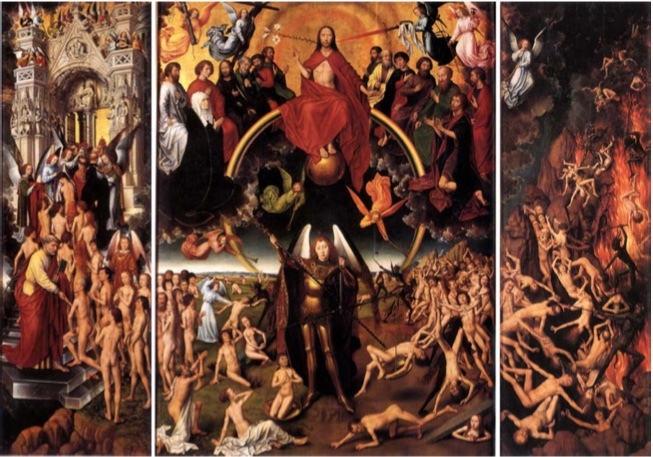 For his entire life political controversy followed, or more accurately, was crafted by, Rivera. Man at the Crossroads briefly adorned 30 Rockefeller Center in Manhattan. The panel on capitalism was just fine. The one on social ethics, which contained an image of Lenin, got the whole thing ejected. (He did repaint it later in Mexico). “Rivera saw and painted the significance of Detroit as a world city. If we are proud of this city's achievements, we should be proud of these paintings and not lose our heads over what Rivera is doing in Mexico today." 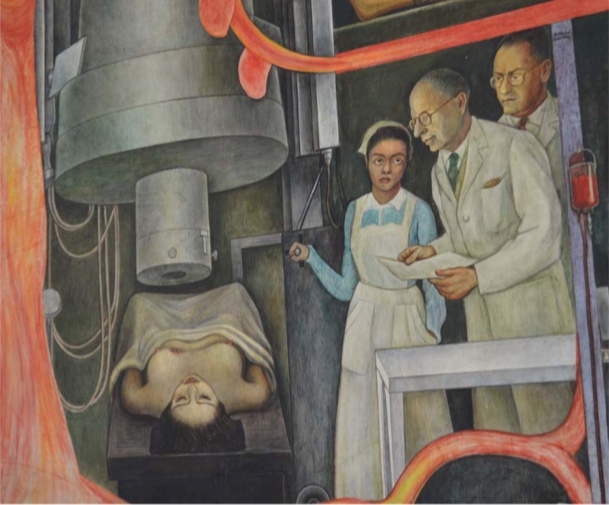 That was written in 1952, at the very time Rivera was setting to work on the mural History of Medicine in Mexico: The People's Demand for Better Health. We present an overview of the mural, taken mostly from a very informative doctoral thesis by Gabriela Rodriguez-Gomez, UC Riverside (2012). An annotated outline of the mural is provided in the thesis, if you want to study the images in detail. Moving from right to left, we migrate chronologically from indigenous Nahuatl medicine to the miracles of modern medicine. The central deity in this case is Tlazolteotl–Ixcuina, the “Earth Mother”. Also on the central panel are depictions of herbal medicines, a mask of life and death, and two versions of the Serpent Quetzalcoatl, blue for water and green/yellow for air and wind. 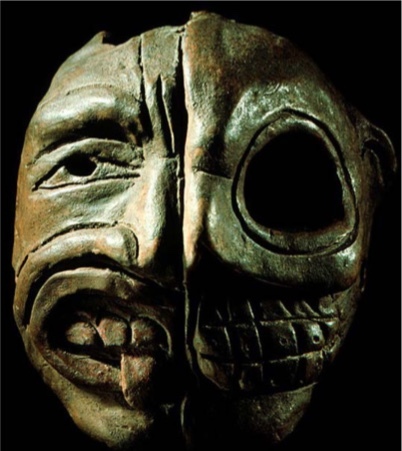 On the right (anatomic, or stage, left—for all you doctors and/or actors out there) we see the sun, signs of human sacrifice, dentistry, eyedrops, soothsaying, trephination, suturing, peyote, breast cancer surgery, a medicine man, collection of mold from tortillas, white magnolia, enemas, sweat baths, and two child births, one a stone sculpted goddess squatting alone, the other, a realistic depiction with native attendants. The far right side curves around and shows the Tree of Life, a duality mask, a pediatric scene and a nurse holding the proclamation of the commission along with names of the collaborating artists. On the left side we see the moon with a rabbit inside (a whole ‘nother story), the IMSS building, factories, churches, housing, Dr. Lombardo (Director of IMSS), workers demanding medical attention, an ‘industrial family’ including a young girl with post–polio leg atrophy, heart–shaped fruit, dove, olive branch, Dr. Garza giving a Mantoux test, an xray exam, EEG, EMG, EKG, radiation therapy for a breast cancer, modern child birth, some sort of instrument illuminating a list of vitamins, and blood transfusion. On the far left is another duality mask, the Tree of Health and nutrient extraction for fruits and vegetables. ‘Going to Mexico’ for ‘alternative medicine’, particularly quack cancer treatments, is a prominent social meme that is misleading as to the general case of health care in that country. In fact, one now sees stories of satisfied Americans in border states who travel to Mexico for conventional care at less expense and equal satisfaction. In some regards, healthcare in Mexico has achieved world–wide acclaim. For example, during the Swine Flu epidemic of the 2009 “the World Health Organization director said that Mexico "gave the world a model of rapid and transparent reporting, aggressive control measures, and generous sharing of data and samples.” And in 2012, Mexico met a goal for which the US still falls short: universal health coverage. So, in this expansive public artwork we are shown the human relationships in healthcare, from shamanism to white coats, all with reminders, subtle or otherwise, that technological advances in healthcare should not interfere with the sacred/professional bond between caregiver and those in need of care. And as a political message, it allowed the government of Mexico to convey its commitment to the growing working class of an industrializing society that was Mexico in the middle of the 20th century. The mural is on display at Centro Médico Nacional de La Raza, Mexico City, Mexico. 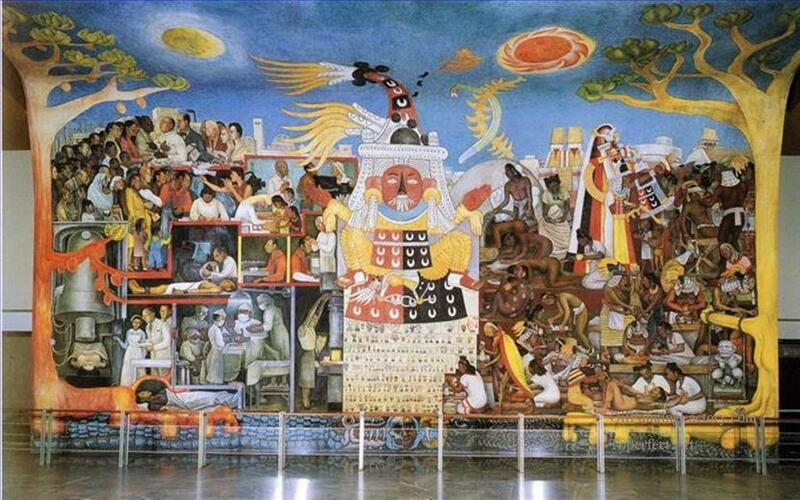 Rivera also did history of cardiology murals for the Institute of Cardiology in Mexico City, and one on the history of Mexico. He appears as one of many figures in the 1999 movie Cradle Will Rock, about the making of the 1937 play that portrayed the surge of interest in socialism and communism that erupted during that era, amongst both the intellectual and worker classes of Western societies. Khan Academy has a brief survey of the three great practitioners of Mexican Muralism: David Alfaro Siqueiros, Diego Rivera, and José Clemente Orozco. Behind a pay wall but worth a look is Diego Rivera and His Extraordinary Art of Medicine and Surgery by a physician Luis H. Toledo-Pereyra, Editor-in Chief of Journal of Investigative Surgery. Framed prints are offered on Amazon, (afflliate link). And I would recommend looking at both the autobiography and the seminal book The Birth of the Clinic. For books on the history of medicine, have a look at this list on our Amazon affiliate link.